February 2015 • SMT Magazine 21 rISK aNd MITIGaTION FOr TIN WHISKerS aNd TIN PeST continues Feature Tin plating on alloy 42 can result in tin whis- kers due to a mismatch in coefficient of ther- mal expansion in environmental conditions, which increase compressive stresses in the tin, as shown by Oberndorff, et al.  . In the same pa- per, Oberndorff and his colleagues showed that corrosion of the tin-enhanced tin whiskering, supporting a consensus on this topic. It also ap- pears that the presence of some rare earth ele- ments in the tin will enhance tin whiskering  . The Occurrence of Tin Whiskers People who are concerned about tin whis- kers often have the sense that tin whiskers are ubiquitous and are an unmanageable threat to the reliability of all electronics products. Their perceived ubiquity is likely linked to a few prominent iconic photographs, such as seen in Figure 4. Supporting this belief is the following story. At a workshop in 2008, a speaker was ad - dressing reliability concerns related to tin whis- kers. A senior technical leader from a major mobile phone manufacturer asked the speaker a few questions. The speaker finally asked the technical leader, "Does your company have a tin whisker mitigation strategy for mobile phones?" The response was, "We will, as soon as I get back to the office." I will readily agree that this response is the right one, but the technical leader's company had manufactured hundreds of millions of lead-free mobile phones starting in 2001, with a failure rate statistically equal to or less than phones manufactured with tin- lead solder. Clearly, for over seven years, this company did not have significant issues with tin whiskers, even without a plan. This good fortune may be because the component manu - facturers had taken some effort to mitigate tin whisker risk. The perception of the omnipresence of tin whiskers is also enhanced by the NASA God- dard Tin Whisker website  . 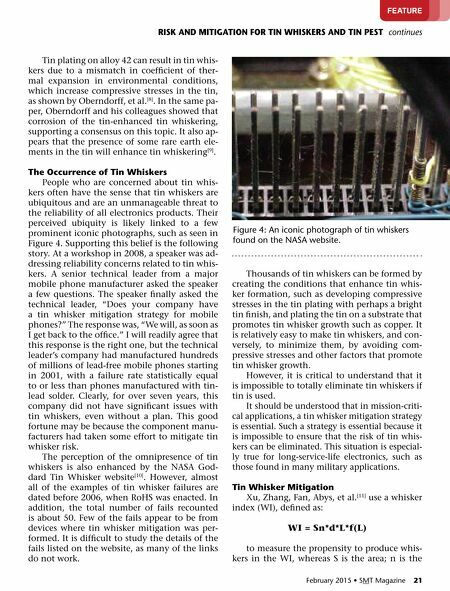 However, almost all of the examples of tin whisker failures are dated before 2006, when RoHS was enacted. In addition, the total number of fails recounted is about 50. Few of the fails appear to be from devices where tin whisker mitigation was per- formed. It is difficult to study the details of the fails listed on the website, as many of the links do not work. 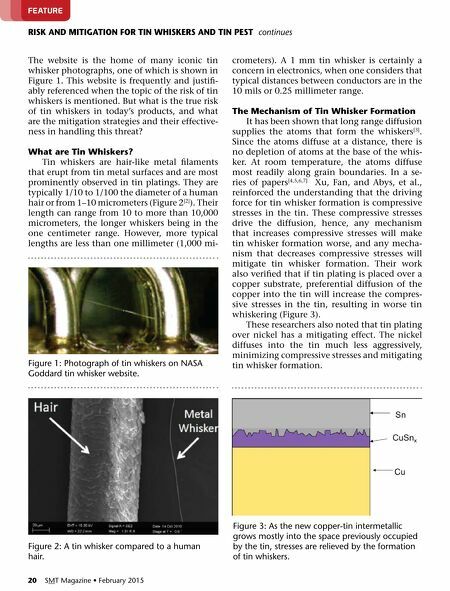 Thousands of tin whiskers can be formed by creating the conditions that enhance tin whis- ker formation, such as developing compressive stresses in the tin plating with perhaps a bright tin finish, and plating the tin on a substrate that promotes tin whisker growth such as copper. It is relatively easy to make tin whiskers, and con- versely, to minimize them, by avoiding com- pressive stresses and other factors that promote tin whisker growth. However, it is critical to understand that it is impossible to totally eliminate tin whiskers if tin is used. It should be understood that in mission-criti- cal applications, a tin whisker mitigation strategy is essential. Such a strategy is essential because it is impossible to ensure that the risk of tin whis- kers can be eliminated. This situation is especial- ly true for long-service-life electronics, such as those found in many military applications. Tin Whisker Mitigation Xu, Zhang, Fan, Abys, et al. use a whisker index (WI), defined as: WI = Sn*d*L*f(L) to measure the propensity to produce whis- kers in the WI, whereas S is the area; n is the Figure 4: an iconic photograph of tin whiskers found on the nASA website.